In the mood for a scenic road trip starting in Bend, Oregon and ending in one of the most pristine national parks on earth? 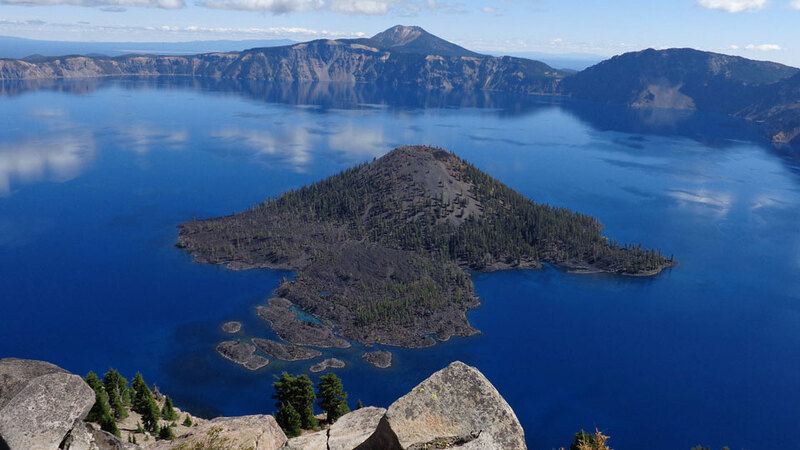 Crater Lake National Park features towering cliffs, stunning volcanic islands, and water so shockingly blue, you’ll stand blinking in the sun trying to clear your vision in case the whole thing is one big, beautiful mirage. Located two hours, eight minutes, and thirty four seconds from Bend Oregon (give or take), Crater Lake is an incredible must-see day trip from your Bend home base. At 1,943-feet deep, it’s the deepest lake in the United States, and the seventh deepest in the world. Crater Lake formed when Mt. Mazama erupted approximately 7,700 years ago in a massive volcanic eruption. Then the whole thing collapsed on itself, creating a big hole that eventually filled with water to become the amazing lake you see today. You can visit Crater Lake any time of year, though some of the roads and facilities are closed during the winter when the area gets an average of 44 feet of snow. But all that snow makes it a great time to enjoy Crater Lake’s popular ranger-guided snowshoe walks between November and April. The walks last two hours ​over a mile of moderately strenuous terrain, while exploring forests and meadows along the rim of Crater Lake. You can also bring snowshoes or your cross country skis from home and set out exploring on your own. The park’s north entrance is closed during the winter months, but the national park can still be accessed by using the southern entrance. Summer is the most popular season for visiting Crater Lake, and for good reason. Hiking, camping, fishing, picnicking, swimming – and even scuba diving – are popular pastimes in the warmer months. The lake makes an incredible backdrop for family reunions. Keep in mind the season is short, generally spanning from June until the first snowfall in September. The average lake temperature below 300 feet is a chilly 38 degrees, but the surface can warm to 55 or 60 degrees during the summer months. There’s only one spot where it’s safe and legal to access the lake shore for swimming. The Cleetwood Cove Trail opens mid to late June, is 1.1 miles long, and drops nearly 700 feet to the shoreline where you can safely swim in the chilly water. If you dare, dive into the crystal clear lake water from the 20-foot rock ledge, which has become a ritual for many brave swimmers. Over a hundred years ago, many travelers were not able to experience the beauty of Crater Lake due to a remote location far from paved roads. Then along came William Gladstone Steel who constructed the historic Crater Lake Lodge in 1915 and even spearheaded the park’s designation as a national park in 1902.
casual dining, lodging, visitor information, a gift shop, and, of course, endless blue vistas. Crater Lake lodging is fairly limited when it comes to hotels and lodging so many visitors choose to stay at hotels and motels in nearby Bend, the largest city closest to Crater Lake National Park. The historic Crater Lake Lodge is the only Oregon hotel located within the national park and it fills quickly. Camping, RV sites, and cabins are available seven miles from the lake rim, near the south entrance, at Mazama Village Campground and RV Park.Whether you are on vacation in Bend or taking a road trip across Oregon, plan a day to explore one of the nation’s most stunning national parks. Established in 1902, Crater Lake National Park is in the Cascade Mountains of southern Oregon, about 90 miles south of Bend. Formed 7,700 years ago by the eruption of the now-collapsed volcano, Mount Mazama, Wizard Island is a cinder cone near the western edge of the lake. The Rim Drive around the lake offers views of the volcanic formations. The park has a number of trails, including Sun Notch, with views of the Phantom Ship, a small island. Fed by rain and snow, it’s the deepest lake in the USA and perhaps the most pristine on earth with its deep blue water. The park is open year-round, 24 hours a day. However many of the park’s roads, trails, and facilities are closed seasonally due to snow. Check the website’s current conditions page to find out what’s open in the park each day. Rim Drive becomes a trail for skiing and snowshoeing. The North Entrance road becomes a snowmobile trail. These roads close for the season with the first big October snowstorm, or on November 1, whichever comes first. Payment can be made by cash, check, or credit card. Currently, the park sells the Crater Lake Annual Pass and America the Beautiful Annual Interagency Pass at the visitor center during operating hours (10 a.m. to 4 p.m.). Other special passes may be available weekdays as staffing allows. Cell reception in the park and surrounding areas is limited. Be sure to carry a map or GPS. The park does not have a physical street address, so it can be hard to locate us using GPS. Try entering “Crater Lake” or “Rim Village” as a town or waypoint. The Park Headquarters is 3 miles south of Rim Village.